That space under the stairs – who hasn't wondered how it could be better utilised? And who hasn't, at some point, stuffed it with mismatched boxes full of things that don't seem to have a home elsewhere? Time to make the most of that cupboard under the stairs with our comprehensive guide to under stair storage ideas. From practical, affordable shelving options to lavish wine rooms, you'll never underestimate the potential of this part of the house again. Completely re-designing your hallway? Check out our expert guide for more practical advice too. Even modest sized homes have decent under stair storage space. Make the most of yours by putting in a central door to create a spacious cupboard for large items (or lots of small ones); a door beneath the bottom steps for seldom used items; and use leftover space for a shelved-out niche, like the one below. A downstairs cloakroom great use of under stair storage is a must-have for many potential house buyers, and a valuable asset in a family home. If you're tight on space, it makes most sense to put the loo beneath the sloping ceiling (like the one below), and to fit a sliding door rather than one that opens out into an already squeezed hallway. If you want to create an impression of space in a small hallway, keeping the cavity under the stairs open is a good option. Then, it's just a case of fitting shelves and investing in stackable storage to fill the space in a bespoke way. Choose a simple colour scheme for the boxes to make the space look as neat as possible. Take inspiration from Ikea's clever de-cluttering with the Sortera range. Find more small hallway design ideas in our inspiring gallery. The under stair area is just asking for shoe storage! After all, most staircases are usually close to the front door, so it makes sense to buy clever hallway shoe storage to keep the space neat. The Argos Understair Shoe Storage Unit is perfectly shaped to slide easily under the stairs. If you like more of a rustic vibe in your hallway, a welly box needn't just be used for your Hunters. This shoe unit from Cox & Cox has a combination of tall and short compartments means there’s room for wellies and knee-high boots as well as shoes. We have a load more hallway shoe storage ideas if you are after more inspiration. Not all under stair storage has to be fitted. If you can squeeze a free standing side board under your stairs, then this will add a bit of extra storage, plus a surface area for you to decorate to your hearts content. The Ikea Hemnes side board/shoe cabinet, is a fave amongst small hallway owners as it's super slimline being only 30cm deep, so it's sure to slide under most staircases. Inject the under stair area with a bit of class by turning it into a library. Good at DIY? You can fit the shelves yourself, or choose modular, ready-made shelving to fit the space. This sleek, contemporary stair design is by London's Lipton Plant Architects. For those who like a bit of privacy when working from home, but do not have a separate study or home office, a bespoke under stair study space is ideal. Although the space will be relatively small, the advantage is being able to design and style it exactly how you want it. Check out more small home office ideas for a ton of inspiration. 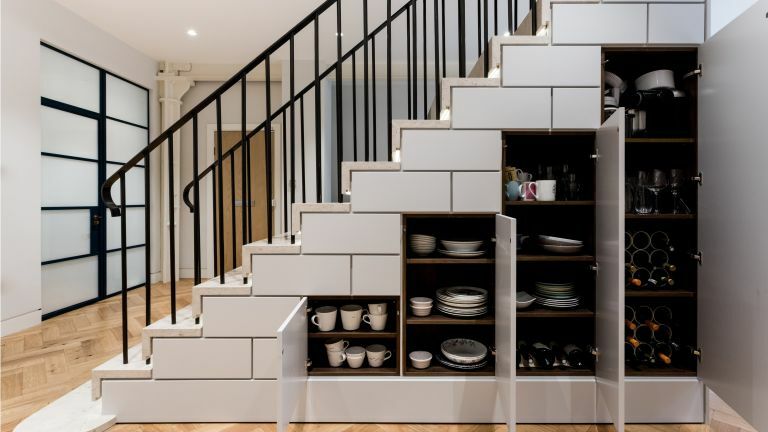 If your staircase is in your kitchen or dining area, why not design the under stair cupboard to hold everything you need to hand, whether dinner tableware or table linens? If it's within the kitchen area, you could design the cupboard fronts to mimic those of your kitchen cabinets – ideal for making a small space look more streamlined. John Lewis of Hungerford have a bespoke solution for an under stair space that’s next to the dining room. For more tips on pratical pantry storage, check out our ideas. Maybe your house has no basement for storage, or you simply don't fancy going down into a cellar every time you want to open a bottle? Why not utilise that space under the stairs and create a beautiful, functional wine room? A real step up from the classic wine rack, you wine buffs might like to create a climate-controlled space that's lit to show it off, too. Find out how to create a wine cellar in our guide. This wine storage below was created by Sorrells Wineracks. Toys scattered around the hallway can test even the most serene parent's patience, but large, pull-out storage drawers make for an ingenious toy storage solution for that awkward under stair space. Why stick to toys? Drawers are an ideal under stair storage solution for stashing shoes, gloves, hats, coats and even cleaning products. These drawers are by Clever Closet. Animals love a nook to steal some precious napping time in, and what better place for it than the cosy under stair space? You can buy and put a pet bed or pet igloo under the stairs, or go for a more streamlined solution - a bespoke under stair pet area. The one shown here is by the design studio Create Perfect. Looking for a new snooze pad for your furry friends? Check out our round up of the best pet beds. Bespoke under stair storage solutions can help integrate all your sundry bits and pieces into a modern, clutter-free open-plan interior. This intricate example is by Roundhouse Design. Not everyone has the luxury of a utility room. But if you want to free up space in your kitchen, or simply move your washing machine somewhere more sound-proofed, why not create a mini laundry room beneath the stairs? This clever under stair storage solution by Inspired Kitchen Design tucks not one, but two washing machines under the stairs. More washing done, no space wasted! Find out how to design a utility room in our guide. Children love a den to play in, so why not create one under the stairs? CplusC Architectural Workshop created this striking space as part of a bespoke residential project in Dulwich Hill. Not only is it perfect for kids to play in, but it also looks like a stunning modern sculpture. If you DO have the space, check out these lovely ideas for a playroom. A great under stair storage idea is to cleverly use cupboards to make the room feel bigger. All you have to do is swap plain, painted doors for mirrored doors that will not only make the room feel larger, but brighter, too. This beautiful design is by Barbara Genda. Use these mirror design and display ideas to make more of your space. Like open-plan living, but don't have the space? With the help of clever bespoke design, the area under the stairs can be transformed into a fully fitted kitchen, complete with ample cupboard storage. In this bespoke under stair kitchen design by Bisca, the fitted cupboards effortlessly complete the open-plan look and connect the space to the dining/living area. Space for bike storage can be tricky to find, especially if you don't want to banish your bike to the garden or the shed. So take inspiration from this inventive under stair storage idea and use the space to store your bikes. You can install wall-mounted storage such as The Endo to either keep you bikes against the wall or you could turn them into a bit of a design feature and fit them to the underneath of your stairs. For more nifty bike storage ideas, check out our gallery. If you don't have room for a full on Dickens-esque study in your home, you could always turn under the stairs into your writing/reading/pipe smoking den. Just check out this idea from Period Living – pick out some lovely cosy wallpaper (tartan definitely works here), add a bureau and a small bookcase and you're sorted. Don't have the room under your stairs for a built in cloak room? Or maybe a fitted design doesn't suit your style? Instead opt for a a nifty wall unit that will do everything a cloak room can and only take up a fraction of the space. We love this super pratical shelf from John Lewis. With three sections and nine hooks to move around as you wish, you can assign everyone their own module or go freestyle when it comes to hanging coats and keys, and use the shelf for those other curious bits and bobs that usually end up amassed on top of the hall radiator or slung on the stairs.